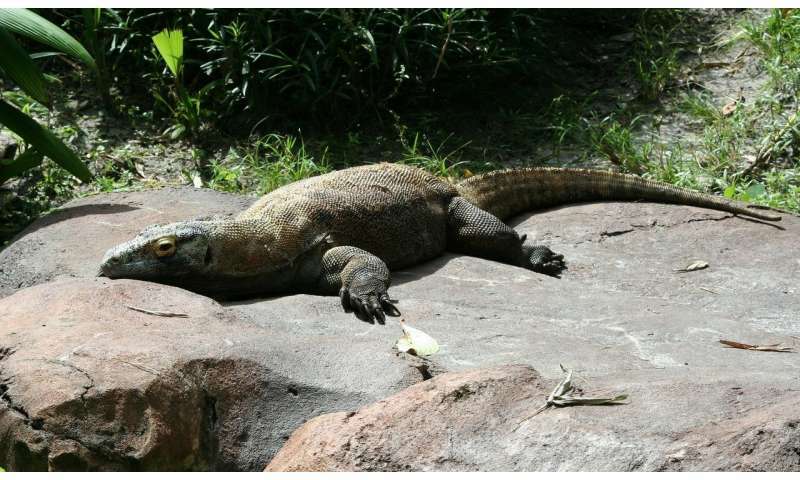 A team of researchers from Australia, Indonesia, Italy and Denmark has learned more about Komodo dragons in their search to better understand reduced island dispersal in island species. In their paper published in Proceedings of the Royal Society B, the group describes their study of the world's largest lizard and what they found. Prior research has shown that creatures that have evolved on islands are reluctant to disperse, which some have found ironic due to the very nature of their existence—some degree of willingness was required for their ancestors to migrate from their original homes. To better understand why island species are so reluctant to venture far from home, the researchers carried out a study of one such species, the Komodo dragon. Komodo dragons live in Indonesia, on the islands of Flores, Komodo, Rinca Padar and Gili Motang. They have strong legs and can grow to be 10 feet in length. But they do not like to travel. The researchers with this new effort found that they rarely if ever venture out of the valleys in which they were born. To better understand their reluctance to travel, the researchers studied them for 10 years on all four islands. As part of their observations, they also subjected several specimens to tests—some were transported to distant locales, for example. Such testing showed that the lizards were capable of traveling—one walked back 13.7 miles to its home after being carted to a different site. They can swim quite a distance, as well—one was carried to another island and swam back. The researchers report that every single time they moved one of the lizards, it made its way back home. Unfortunately, long-term observation of the lizards offered no explanation regarding their reluctance to travel. This proclivity, the researchers found, actually causes harm to the lizards. Their unwillingness to travel puts them at risk of inbreeding, and at times food is hard to come by due to competition among groups. The researchers suggest the reluctance to migrate is possibly due to the nature of island living—moving could carry unknown risks, such as having to deal with predators, finding food or even a mate.